Waving signs that read "Stop abortion now" and carrying pictures of bloody fetuses, thousands of protesters have held a rally and march within sight of the White House. Abortion opponents from as far away as Texas, Kentucky and Massachusetts attended their annual march against the Supreme Court's 1973 decision to legalize abortion. Demonstrators cheered as President Bush voiced his support for them by phone from Camp David. They also heard from a stream of lawmakers who say they support the cause. President Bush told abortion opponents over broadcast loudspeaker Monday he shared their support for "a culture of life" and that "this movement will not fail." This year's demonstration comes amid speculation that Mr. Bush may soon get to nominate new justices to the court. That could lead to overturning Roe versus Wade. "We need most of all to change hearts and that is what we're doing," Mr. Bush said as anti-abortion activists marked the 32nd anniversary of the Supreme Court decision legalizing abortion with a day of rallies, protests and other activities. The issue took on new urgency with the likelihood of a high court vacancy. Mr. Bush addressed marchers by phone from the presidential retreat at Camp David, Md., where he had spent a long weekend. He said that while the day when every child is "protected in law may still be some ways away … even from far side of the river we can see its glimmerings," CBS News Correspondent Mark Knoller reports. Every anniversary of Roe v. Wade, the 1973 Supreme Court decision, prompts demonstrations by opponents and proponents of abortion rights. Activists on both sides of the abortion issue marched in demonstrations across the country Saturday, the actual anniversary of the Jan. 23 decision. This year there is increasing speculation that Chief Justice William H. Rehnquist's poor health may force him to step down. Rehnquist, 80, has thyroid cancer and last week appeared frail as he swore Mr. Bush in for a second term. Three other justices have had cancer and only one, Clarence Thomas, is under 65. One or more court vacancies would give President Bush the chance to install another justice or justices who oppose the Roe decision, increasing the likelihood that at some point, the ruling could be overturned. Mr. Bush conceded that a society "where every child is welcome...may still be some ways away." Still, he said, he was working with Congress to pass "good, solid legislation to protect the vulnerable." He cited his signing of legislation last year to outlaw certain late-term abortions. "You know, we come from many, different backgrounds, but what unites us is our understanding that the essence of civilization is this: The strong have a duty to protect the weak," Mr. Bush said. He has said he supports a constitutional amendment to outlaw abortion, but has not actively pushed for it. Mr. Bush also said that he would continue "seeking common ground where possible and persuading increasing numbers of our fellow citizens of the rightness of our cause. This is the path of the culture of life that we seek for our country." On Monday, abortion opponents staged a rally before a march from the Ellipse to the Supreme Court. 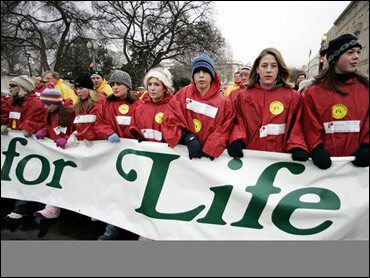 Other groups opposed to abortion rights were holding events on Capitol Hill. NARAL Pro-Choice America has projected that 19 states would quickly outlaw abortion, and 19 more might follow suit, if Roe v. Wade were overturned. Last week, Norma McCorvey, the woman known as "Jane Roe" in Roe v. Wade, asked the Supreme Court to overturn its 1973 decision.